Burwood Shutters offers an advance range of automatic gate openers that can provide extra security, protection and convenience to your home or business. 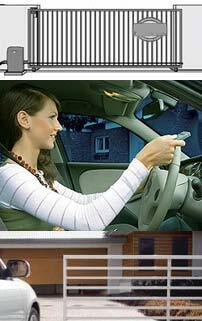 Automatically close and open your gate by remote control from the comfort and safety of your car or home. Have greater control over who has access to your property. Sliding gates of most dimensions can be easily and professionally automated by Burwood Shutters. Controlling these automatic gates is as simple as pressing a button on the supplied remote control transmitters. An easy release system using a key lock beside the motor for manual operation is available in case of power failure. Our openers feature low noise operation and an advance rolling code protection technology. These automatic gate systems are virtually maintenance free.